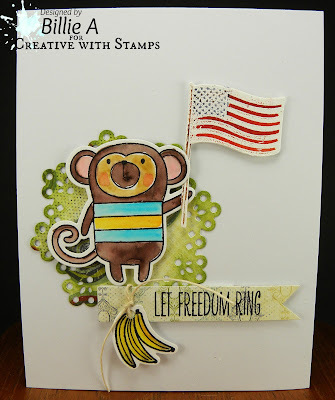 I looked through my stamps for an animal that could hold a flag and found this cute monkey and bananas from My favorite things..I used a Paper trey ink doily die. 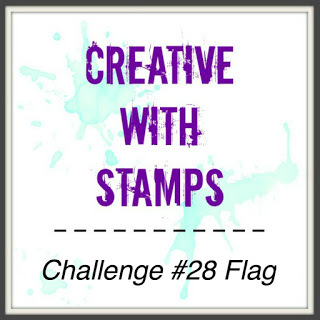 I stamped and embossed the Tim Holtz crazy bird flag accessory and colored them with Mission paints and Ranger re-inker. I punched a hole and strung twine and added it to the end of the Verve sentiment. This is so cute Billie. Love the the little critter holding the flag. love the flag he has bring and love that doily is it MFT or Papetrey Ink? Lovely CAS design. Thank you for joining in the QKR Stampede challenge. This is so adorable, Billie. Love that monkey with the flag and the bananas attached to the sentiment. What a fun card - perfect for the prompt. Everything is better - Catch the bug - Humor Wed.